Locabulary is an iPhone app developed for augmentative and alternative communication. Words and phrases are made available based on your GPS location. Custom lists of phrases can be stored on the iPhone, and also in the Locabulary Cloud, so you never have to worry about losing your hard work. You can also share lists with others, and download lists they’ve shared. With Locabulary, you can easily speak the right words in the right place. In fact, the app is designed for people with disabilities, but could easily be adapted for second language users. I had envisaged something more sophisticated than a mobile phrase book, though. My app not only uses GPS to predict your situation-specific language needs, but taps into a corpus of language that has been gathered, and is continuously replenished, by crunching data from locally relevant social networking sites. The corpus throws out keywords and keyphrases (i.e. those words and phrases that are significantly frequent) so that you could go into a pub, for example, and know not only how to order a pint, but what people have been talking about over the last 24 hours. Eventually, the corpus could be fed by audio and video surveillance devices, a bit like Deb Roy’s Human Speechome Project, where ceiling bugs in his apartment captured every waking moment of his son’s language development over a three-year period. Capturing and reconstituting the traces of language use would seem to be one of the more useful spin-offs of mobile technology. The billions of words that are digitally generated, transmitted and stored on a daily basis offer an unlimited and continuously updated resource for language users. If, as Bakhtin suggested, all texts contain the echoes of the texts that preceded them, then the act of retrieving these echoes may be both a tool for language use and a trigger for language acquisition. As Hopper (1998: 171) argues, in proposing that grammar is an emergent phenomenon, ‘The task of “learning a language” must be reconceived. Learning a language is not a question or acquiring grammatical structure but of expanding a repertoire of communicative contexts’. However, communicative contexts are not static. They are in a state of constant flux. This is why phrasebooks are so limited in terms of their usefulness, since they are frozen in time and, to a large extent, place. More than at any time in history, perhaps, language is on the move. As Alistair Pennycook (2012: 127) puts it, in his most recent, startlingly original book, Language and Mobility: ‘Languages are not stuck in one place but are mobile … Synchronic structuralist snapshots of language stuck in time and place have never been able to account well for languages as used by mobile humans, let alone humans with mobiles’. 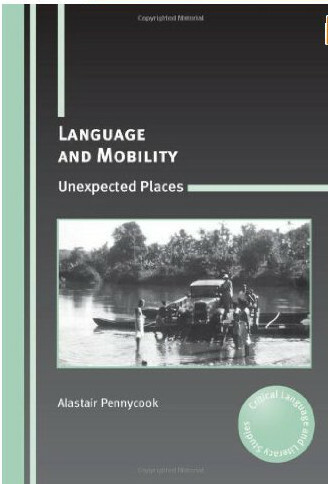 The essential mobility of language means that it turns up in unexpected places (hence the strapline of Pennycook’s book), and (pace Bakhtin) that it is used unexpectedly. 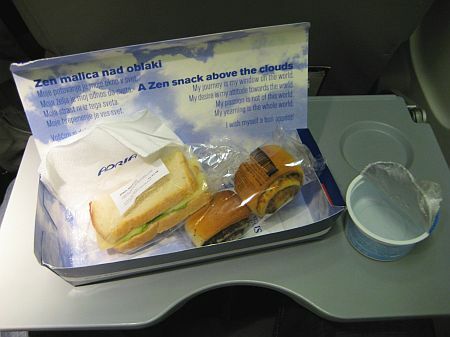 Witness the quasi-mystical text on a lunchbox on a plane en route to Ljubljana (‘A Zen snack above the clouds’). Or (Pennycook’s example), a verse in Hebrew from the Song of Solomon, tattooed on David Beckham’s forearm. The tension – and challenge – of successful communication is in negotiating the given and the new, of exploiting the predictable while coping with unpredictability. To this end, a phrasebook, a grammar or a dictionary can be of only limited use. They are a bit like the stopped clock, which is correct only two times a day. To function with language as we move through space and time, we need to be both retrieving the sedimented traces of previous contextualized language use, and simultaneously reconfiguring these traces for our evolving needs. ‘At its most basic,’ argues Canagarajah (2013: 7) ‘communication involves treating languages as “mobile resources” (Blommaert, 2010, p. 49) that are appropriated by people for their purposes; these resources index meaning and gain form in situated contexts for specific interlocutors in their social practice’. Or, as Pennycook (2012: 100) puts it, ‘we have repertoires of linguistic resources which we use locally’. And he adds, ‘our goal as language educators might be better understood as developing resourceful speakers rather than some vague notion of native competence’ (p.170). The language resources he alludes to could, conceivably, include the kind of mobile app I dreamed of – an app that is mobile in at least two senses of the word. But the app alone would not be enough: we would need to know how to use it adaptively. Language is a moving target. Blommaert, J. (2010) The Sociolinguistics of Globalization, Cambridge: Cambridge University Press. Canagarajah, S. (2013) Translingual Practice: Global Englishes and Cosmopolitan Relations, London: Routledge. Hopper, P.J. (1998) ‘Emergent language’, in Tomasello, M. (ed.) The New Psychology of Language: Cognitive and Functional Approaches to Language Structure, Mahwah, NJ. : Lawrence Erlbaum. Pennycook, A. (2012) Language and Mobility: Unexpected Places, Bristol: Multilingual Matters. Where I come from, in Newcastle, there were a series of books published to entertainingly ‘aid’ outsiders in their interpretation of the local dialect. They went under the title Larn Yersel Geordie. They are no doubt now available in App form. Living as I do now in Berlin, I’ve discovered many additions to my general German vocabulary as taught in England – the conversational use of “Genau!” for example, where the speaker agrees with what’s just been uttered and can mean either “that’s right” or “exactly” depending on context. There’s also, of course, the Locabulary of Berlinerisch, in which the word “gut” becomes “jut”, which I’ve barely begun to penetrate. Being in Berlin perhaps increases my sensitivity to the notion of surveillance and its uses. I say this in relation to Deb Roy’s experiment. The fact he performed it in his own home and “on” his son, is laudable. The findings are interesting, though (to me at any rate) not particularly earth-shattering in terms of the examples he gives. What I did find much more disquieting however was the way the MIT funded research was actually and ultimately in the service of broadcast corporations, studying how often their brands were mentioned on social media. The idea of using video and audio surveillance to record people unawares is chilling to me. I realise that Linguists have long sought ways of capturing real speech for the Corpus and that these ways very often involve an element of subterfuge, asking one question in order to record speech rather than genuinely seeking the answer. Perhaps it’s inevitable that there’d have to be some kind of covert element to the collection of such data (in the wild as Roy calls it). But technology can be so much more covert than human interaction and I am disquieted by the idea of surveillance being sanctioned for any purpose, given it can quite easily be used for others. Indeed, as in the case with MIT, the corporations who are prepared to fund the more laudable aspects of research, do so in order to gain access to data. Tricky world this brave new one…. Yes, the question of privacy came up for me too. I just finished reading up on the ethics of research on human subjects (required for an upcoming project), at least as it’s seen in the U.S. I learned that *federally* funded research is subject to scrutiny by an ethics review board to assure that such questions are satisfactorily addressed. I wonder about research that’s not federally funded … Interesting question. I agree, Carol, and Kathy, and my proposal to exploit surveillance devices was hugely tongue-in-cheek. The fact is, though, our language use is continuously being monitored: think of the warning often given when phoning any kind of service, that calls are recorded, or the way that government agencies (in the UK and the US and probably elsewhere) store and monitor digital communications, alert to any mention of t*errorism, b*mbs etc. I can imagine there would be plenty of linguists who would love to get their hands on this data base. Yet another looming assault on our privacy (but also a great data collection tool) is Google Glass, the glasses that will allow people to video anything – and everyone – they look at and talk to, without their interlocutors knowing. Our linguistic traces are everywhere, to a degree that Bakhtin could never have imagined. Is it wishful thinking to hope that somehow some of this linguistic detritus could be put to some good use? I’m all for making ethical use of the masses of linguistic information potentially available to researchers. I wonder if there could be some kind of voluntary organization to establish appropriate standards in that regard. I mean, if you’re looking for frequency of usage in a certain context, you don’t need identifying info — aggregated data will do, right? I don’t mind contributing anonymously, it’s when the data can be connected back to me personally that it gets tricky! “It is this ability to simply call up what you need at the very moment you look at or do something that can really enhance experience. …. It promises to put mobile learning on the map, as it is an always there, hands free device that plays to the idea that learning needs to be part of one’s everyday life and reinforced through habit and spaced practice”. On the other hand, any location-based app might have to reach a byzantine level of sophistication to work well for a few reasons: even in a café I may have an ever-in-flux mixture of communicative purposes (order coffee, advise a friend, narrate a episode) with a changing cast of interlocutor; so, perhaps rather than using gps, I can key in the topic, audience, purpose (and genre ?) to get a more accurate fix on my moment-to-moment needs. This will also need to be pitched to my current level of proficiency: as a newcomer to a language one may be better off with generic communication strategies (‘what’s the name for ?’ “ what do you mean ?” ) which will work as means of getting my foot in the door of whatever space I currently occupy. On the plus side, Twitter-crunching would definitely yield topics for conversation and perhaps what stance to take (“yes, ‘your local football team here’ is brilliant”). On a tangential point, I’m not sure frequency is always a good indicator of “keywords” – especially for culturally-sensitive communication; keywords may also include the labels for cultural values (“freedom” “order”) and, while numerically infrequent, may outweigh their rarity with their emotive power. Perhaps related to this is the common tendency of people learning a new language to want to acquire the swear words of the language – perhaps infrequent compared to other words, but highly hazardous material depending on the place and time. Also, relatively frequent yet banal functions such as ‘thanking’ may not be as useful as the ability to play with the language, persuade in the language or deal with a conflict situation. Getting back to mobility, it is true that technology can now gather billions of data points in real time but any learner will need training in sifting through this white noise in order to skillfully capture, reconstitute, reconfigure and retrieve the most frequent “echoes/traces” in current use – as you imply, this is where an app (or a teacher) may come in. In terms of language acquisition, even without help of this kind, a well-noticed phrase seen in context may become an instantly-deployable trope that requires no reconfiguration or reconstitution, in fact faithful reproduction (including associated intonation contour –e.g. “yeah riiight”) and a sensitivity to when it can be deployed, where, with whom, and to what purpose (sociolinguistic competence outflanking grammatical competence). Thanks for the great comment, Declan. In terms of an app that is sensitive to the affective associations of a word or phrase, or is able to rank it in terms of its communicative or generative potential, there would need to be some kind of algorithm that measures more than statistically significant frequency, but perhaps calculates the effect of the word/phrase on one’s interlocutors, as indexed by laughter, high-involvement intonation patterns, or even gesture, gaze and proxemics etc. Is this ridiculously fanciful? (I say this because I know that certain phrases I’ve casually dropped into conversations in Spanish have – occasionally – succeeded in eliciting a response out of all proportion to their semantic ‘value’ – such that I’ve instantly flagged them for further strategic use). This mobile understanding of language and language use makes intuitive sense to me as well as being circumspectly constructed. On the practical side, I also believe that a tool such as a gps/corpus fed software platform or app would be very useful for people to have where I live. In Rio de Janeiro, Brazil, if tourists and visitors (and even long stay ‘estrangeiros’ such as myself) had access to such a tool, participation in Brazilian society would be much easier. I guess when you think in terms of privacy, a scheme in which communicative actions are recorded voraciously could seem scary at the least. Though I don’t know exactly how much of my communicative actions I would really want to be private. I imagine the percentage would be pretty low, and on the upside, people would be able to use my experiences to learn from. That, in fact, sound’s a lot like my current role as educator. . Thanks, David … I can empathize with your ‘estrangeiro’ status, and, likewise, see the pedagogical and communicative potential of a phrasebook (or app) that had been compiled from the previous (successful) utterances of other estrangeiros – that is to say, not the stuff that Brazilians themselves might say, which might be too far beyond my ZPD to be able to retain or use convincingly, but sifted out of the daily encounters of people like me (albeit marginally more fluent) engaging in the same kinds of speech events in the same kinds of contexts. A functionally- and situationally-coded interlanguage corpus in other words. Any takers? I love the idea of language apps that adjust dynamically to our context! I’ve often wished for a smarter spell-checker — one that’s aware of my writing context (subject, genre?) and suggests language that would be more likely in those cases. It would also know lexical chunks, so if I typed “in any cass”, it would be fairly sure I meant “case”. It would be great if it learned a bit about me, too. For example, I prefer “email” to “e-mail”. Similarly, I like the fact that some apps let you look up a word by holding your finger down on the word. Wouldn’t it be cool if it were context-sensitive? If you were reading an academic text, it would check an academic dictionary and/or list the academic sense of the word first. It would know from the sentence that you want the verb form, rather than the noun … and it might recognize the word’s role in an idiom or cultural reference, giving you that background as well. If It knew I was reading in my second language, it would prefer a learner’s dictionary and perhaps refer me to similar sentences from a corpus. I wonder if any developers are dreaming these dreams out there … ? Predictive software knows no bounds, Kathy! What you dream of today will be an app tomorrow. Did you know, for example, that there are sites like Phraseup http://www.phraseup.com/ where you type in the start of a phrase (such as ‘just in…’) and you get the most likely continuations (‘…case, ‘…time’ etc). And Google has some kind of editing tool that does this at the level of the sentence. (Can someone remind me what it’s called and where to find it? I think it may be accessible as a tool only if you use the Google blogging platform, Blogger). Not too difficult, therefore, to imagine tools that will allow whole texts to be written and edited predictively. I should add that the elusive ‘Turing Machine’ – i.e. the interactive robot that is programmed to have human-like conversations – is another extension of the notion of predictability. See http://en.wikipedia.org/wiki/ELIZA, for example, for a history. Thanks for the link to phraseup, I think it could be helpful for my higher level group! The most likely continuations according to whom or what? “This is a crime family affair” seems unlikely in all but a few contexts. According to ‘the dialect of the tribe’, Rob. Viz, Hopper (1998) ‘Language is … to be viewed as a kind of pastiche, pasted together in an improvised way out of ready-made elements’. Viz Sinclair, and his open choice vs idiom principles: ‘The principle of idiom is that the language user has available to him or her a large number of semi-preconstructed phrases that constitute single choices, even though they might appear to be analysable into segments’ (1991). And it is Hoey’s (2005) principle of priming: ‘a word… becomes cumulatively loaded with the contexts and co-texts in which it is encountered, and our knowledge of it includes the fact that it co-occurs with certain other words in certain kinds of context’. And that’s not even getting to the mobile aspect, which is the point of the post. Maybe if I were reading a French text while in Oklahoma, I would get one kind of help whereas if I were reading that text in Montreal, I might something completely different! Interesting post, Scott, and a book or two I’d like to read. I’m uneasy with the notion that language learners might use technology to help them get along in the world much like the disabled do, which reminds me of the doctor-patient analogy to teachers-language learners. I know you don’t draw such a correlation, Scott, as you came across the Locabulary app *after* you’d considered how language learners might benefit from similar technology. I wonder, though, whether this co-incidence merits examination, or might be a politically-correct reflex on my part. Your ideas also have me thinking about creativity and neologism in language: Would ‘cracking the code’ restrict how new lexico-grammatical structures emerge when languages and cultures collide, or would your app simply enhance such hybridization and sharing in new ways? If some neo-luddite were to pose Postman’s question about new technology, What is the problem to which this technology (your app, in this case) is a solution?, Scott, what would your reply be? I like the idea of ‘developing resourceful speakers’, and might rephrase it as ‘facilitating the progress of resourceful language users’. Splitting hairs? Thanks, Rob: let me see if I can take up your question about creativity (I’ll come back to the other questions you raise in good time!). I guess the point of my post was both to imagine a Bakhtinian language tracing machine, while at the same time pointing out its essential weakness, i.e. its incapacity to respond to the unexpected, or, indeed, to be unexpected (which, to an extent, is what creativity is all about). At the same time, as I said to Kathy above, technology knows no bounds, both to capture, store and process data, and to deliver the results of this processing at speed on demand – at the point of need, as it were. The capturing, storing and delivering functions are all already highly developed (although, as has been said, the use of surveillance-type devices has an ethical dimension). What perhaps needs more work is the processing function: how is the data to be sorted and organized in such a way that is is maximally useful to me here now? This comes back to Declan’s point that raw frequency may not be the best indicator of a word or phrase’s utility. Yet it is still at the level of frequency that corpus tools generally function. The idea of an app that allows a user to tap into a the language they need based on a specific context derived from an ever evolving stream of data, or constantly updated corpus is interesting in the abstract, and if done well would probably improve learners ability to negotiate specific situations. But on the whole, I’m wondering if, especially for beginning learners, we are still left with the problem of language overload. Any one piece of language that our learners grapple with in any specific context is going to be, to a certain extent, a simplification. I know that when I was learning Japanese and would order in a restaurant, I always used the phrase “Oaisou” to get my bill. Only after years in Japan did I learn that there are actually location specific ways to say, “Bill, please.” Turns out, “Oaisou” is really only used for sushi restaurants and probably higher end dining establishments. But it was handy and the meaning was understandable in any restaurant. The trade off of having one phrase for all situations allowed me to spend more time learning other things which I needed to navigate my day. Part of learning a language is also learning what you can get away with communicatively, weighing the width of language you wish to acquire versus the depth of language that might be needed to meet a highly contextualized situation. Wouldn’t the app you are proposing, by always providing depth, remove, at some level, student autonomy or ability to chose between either width and depth? Could it actually get in the way of the learning process? I think you’re absolutely right, Kevin, that authentic data might not be the most appropriate nor the most serviceable model (a problem with corpora in general), and thanks for pointing this out. You may note that I’ve taken this into account in some of the replies above – e.g. to David’s need for a learner data base, perhaps. The question of width and depth (I love these terms) might be addressed (in my imagined app) by having options that deliver contextually-relevant language at different levels of, say, particularity, or idiomaticity. It might simply be called the ‘range’ function, not unlike a volume slider: from narrow range to broad range. Does this deal with the autonomy question – at least partly? I think that’s not only a cool idea, but a very interesting and intuitive user interface to navigate the issue. A slider that changes the level of idiomaticity and connects it up to range of use. If you don’t actually make this particular app, I think you still have some great ideas for language apps in general on this post and comment thread. And you could probably moonlight over at apple as a user-interface consultant with all your spare time (which, if we had a sarcasm sensor in the app, would highlight the last sentence in blinking red). I wonder what communication strategies would morph into for a generation with so much collocational information at their finger tips. Cannot help re-interpreting Bakhtin’s, Pennycook’s, Canagarajah’s, and Thornbury’s language mobility as language virtuality. The article also hints at a response to Rob’s question (What is the problem that hand-held technology tries to solve?) in suggesting that it might be ‘maintaining continuity of learning across settings’. Would Augmented Reality make social life look and sound more like social media? Medium as message? I’m not so skeptical, Rob. After all, when you go to a museum nowadays you can ‘augment reality’ by opting for an audio tour (even the written signs on exhibits are a form of augmented reality). I don’t usually like the idea of the audio tour, but I did it recently when I took my sister to see a newly-renovated townhouse by Gaudì here in Barcelona. Our ‘social life’ was notably enhanced by the information we’d just been listening to, as we advanced – and shared opinions – from room to room. I imagine we were also recycling some of the terms (e.g. architectural ones) we’d just been exposed to. Is this the end of language use as we know it? I don’t think so! Could this kind of (shared) experience by mediated by hand-held devices. I think so! We are speaking about using this app when traveling to new locations – be that in a pub in Australia or a hotel in Nigeria. Perhaps it could also work for companies… if there were a corpus coming in from all the employees of a company (let’s gloss over where they get the info) we could theoretically add in the extra level of a specific “company language” to the system? Thanks for the comment, Matt. Yes, I think, from an ESP point of view, ‘my’ app could be ideal, and constantly updated by a stream of documents and conversations (voice recognition software could be brought into play here, for the purposes of transcription). It will be interesting to watch how different approaches to virtual world language learning ( eg, constructivist) jockey for position as market forces do the same. Rob, indulge me. This post, and my comments on it, are a kind of thought experiment. If hand-held devices play any significantly constructive role in language learning (and I have some doubts), maybe this is it! Peace be upon you too, and all your kin! Scott, I am the developer of Locabulary and ran across your blog and I apologize for “getting there first”. Great post and comments with some really great ideas and interesting concepts! It’s interesting that some of these ideas came up in our early brain storming sessions but would have been difficult to implement back in 2008. It would be interesting to revisit in the context of big data / nosql advances. One of the features that we experimented with was detecting the presence (non-fixed location) of another locabulary user, say a friend, which would bring up a bank of phrases that you use with that friend but I believe we nixed the idea because of privacy concerns… of course lots of “find a friend” apps became popular. The other thing we experimented with was using the accelerometer to create inflection or tone… we weren’t sure if it was gimmicky or a usable feature. We also thought about using the app as a way of teaching english sentence structure. We have users in over a hundred countries and a few have told us that they use the app to learn english. You can see our early attempts in the subject-verb-object path but as we were developing for users with limited mobility/dexterity, we focused on minimizing the number taps. When we began looking at all the permutations required to create a basic verb conjugator algorithm we quickly realized that it would be a rather large project by itself. Thanks so much for getting in touch, Gene, and for providing some background to Locabulary. As I indicated in my comments on this post, I’m no expert in apps, and the thread was more a ‘thought experiment’ on my part, but I am excited by the possibilities that such tools have to provide ‘point of need’ language affordances, taking into account the exponential growth of social networking, online language corpora and related tools, augmented reality, including the use of QR codes, and GPS. Watch this space!